Ballard Designs is my favorite catalog! I get so excited to see it in the mailbox. After the kids go to bed, I sit down on the couch to read it. Flipping through the pages of the catalog, I look at each and every detail. My only purchase to date is a monogrammed “M” throw pillow. It was on sale and I had a coupon. That’s pretty much the only way I would consider shopping there. Their prices are high! The drapes were $89 for each 108″ panel. Our bay window has two panels. I had just finished painting my dining room (and adjoining living room) Universal Khaki by Sherwin Williams but the current curtain panels were so similar in color. I needed something to break them up. It had to be something fairly easy because my sewing machine lives in the basement and has never been used. After obsessing about them for a few days, I thought, curtain and ribbon…how hard could this be? 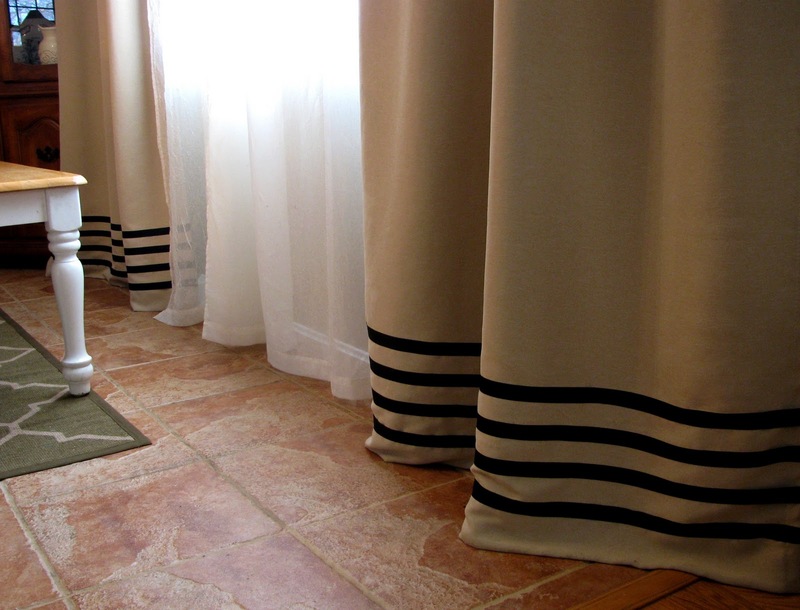 Start by laying out your curtain panel (my panels are 108″ light blocking and 100% polyester). You could also use a cotton/linen blend. 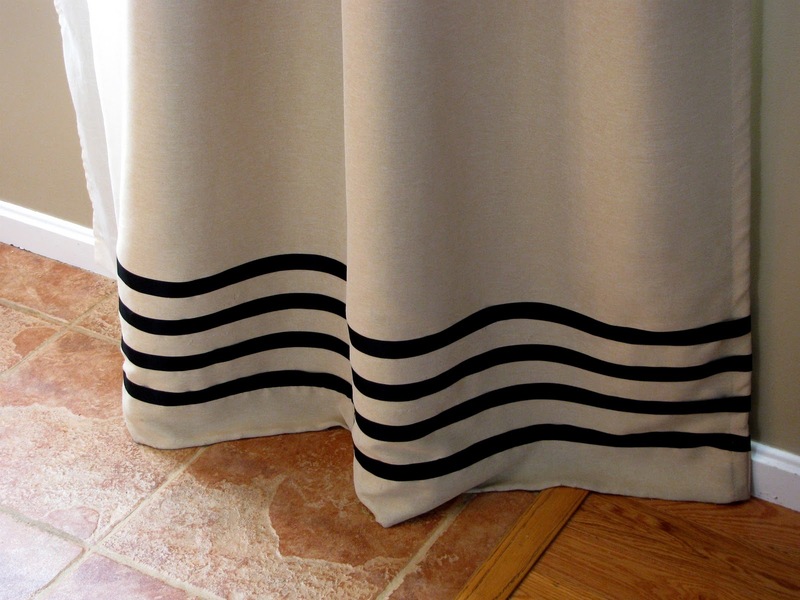 Because of the weight of the curtain, you won’t need to iron out any wrinkles. Ballard’s bottom stripe starts out higher than mine. I chose my placement for a very important reason. I would rather pay $89 for each panel than to measure out the lines and make sure they are even. The thought of it gives me a headache! 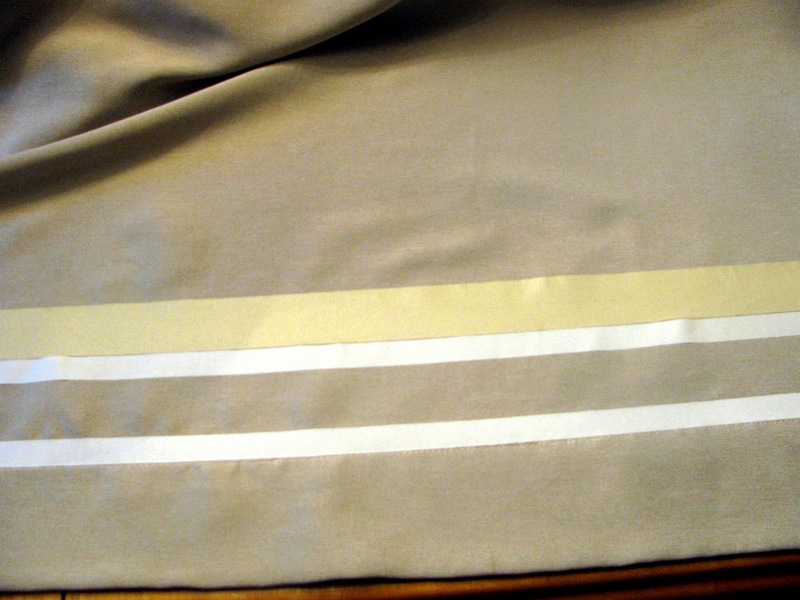 The easiest solution is to place no-sew tape right above the hem line on the bottom of the curtain (if you look real close you can see the thread line on mine) and iron it down. Next, take masking tape (frog tape would also work) and tape right above the no-sew tape. I left a 2″ overhang of tape on each side so the panel was essentially taped to the table while I was working. This was much easier because it wasn’t shifting. Now, lay another strip of no-sew tape above the masking tape and carefully iron it down (I tried not to run the iron directly over the masking tape). Next, pull up the masking tape. 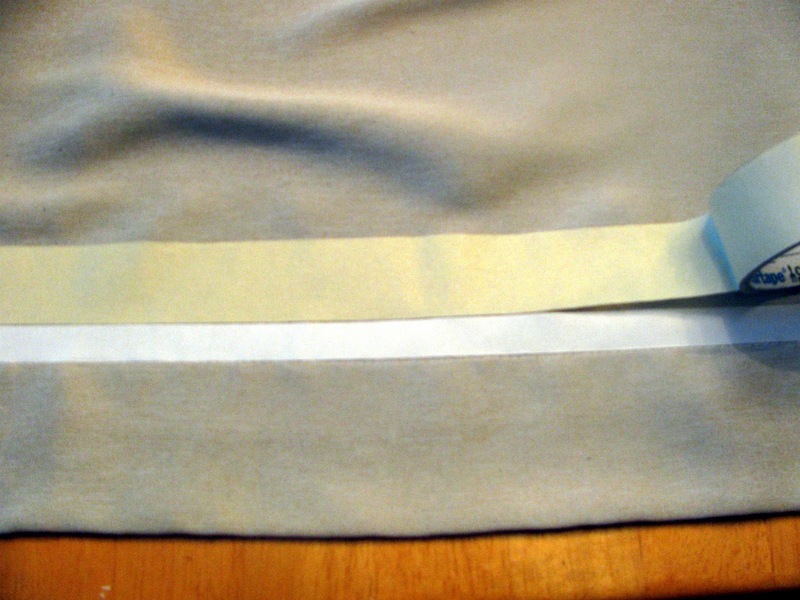 Use the same piece (it should still be sticky) and place it above the second strip of no-sew tape. Give the first two strips a quick ironing once the masking tape is out of the way to make sure they are attached securely. 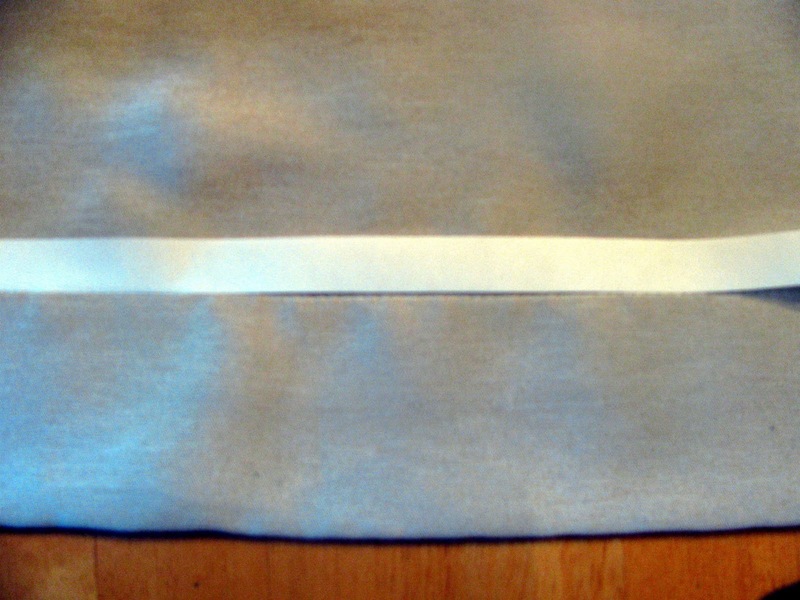 From there, the third strip of no-sew can be ironed down above the tape. 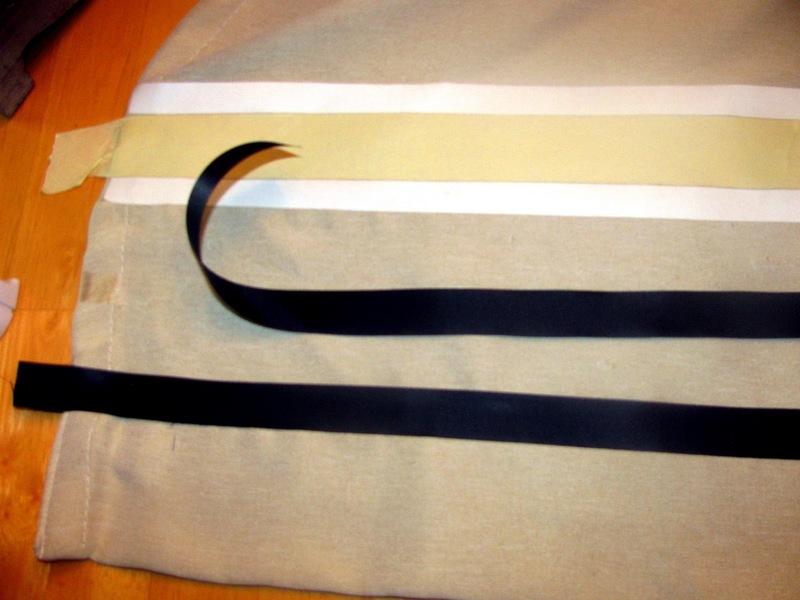 Once the tape is removed and placed above the third strip of no-sew, the final stripe can be ironed down (I chose four stripes using 1″ black satiny ribbon). The possibilities are endless – quantities of stripes, ribbon color and size of ribbon. You can customize your colors and quantities as you wish. Here comes the fun part! Concentrate on one stripe at a time. Pull the paper backing from the no-sew tape and lay the ribbon over the translucent tape residue. It is really easy to eyeball whether or not it is straight. Just run the iron along the strip of ribbon while concentrating on a few inches at a time. Continue with all four (or how ever many you choose) stripes. 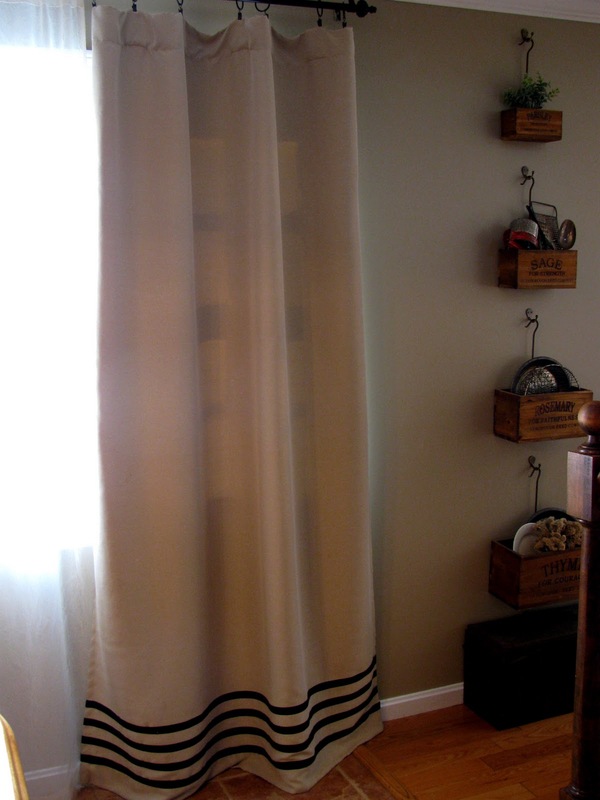 I left a 1″ overhang of ribbon on each side of the curtain. 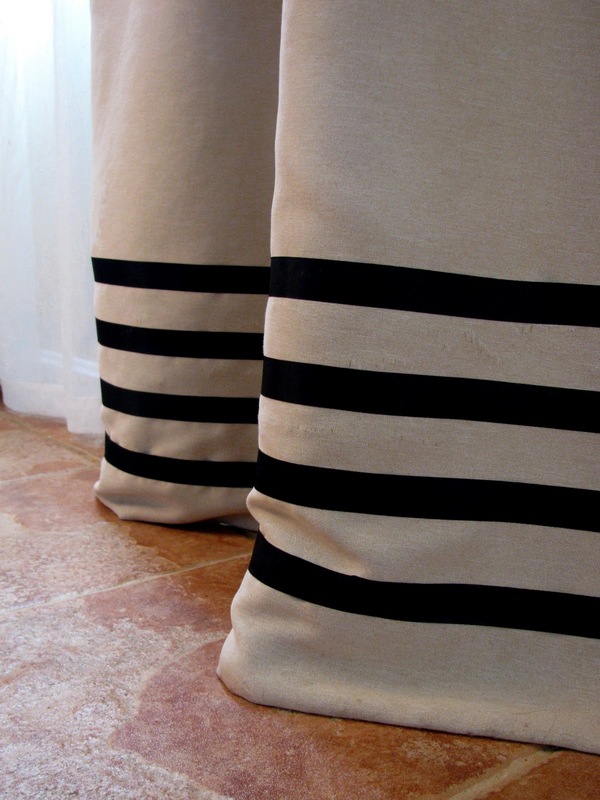 When all of the stripes on the front are ironed down and secure, flip the panel over and use a small tab of no-sew on the back to give it a nice finished look. This may appear to be more work than it is. Both panels were completed within an hour. I’ve been living with them now for six months and couldn’t be happier with the results. Already having the curtain panels, tape, ribbon and no-sew on hand, this project was a lot of bang for $0 bucks. I saved $178! If you purchased all of the required materials, you could still save a significant amount of money. These panels are no longer sold at Ballard Designs. Glad I keep my back-issues of the catalog so I could share this copycat project! Please let me know if you have any questions! Love how these turned out~ I think I might try this myself! I love this idea. Thanks for posting. Thank you so much for the feature! I really appreciate it. I posted about the feature over on my blog. I think some of their prices are on the high side as well. HOWEVER, if you look on the website, there are several outlets. The biggest one i know of is in west chester ohio, north of cincinnati. Its the catalog processing center and its also a Frontgate outlet, territory ahead and the other brands. The deals there are amazing. To give you an idea , I got the really tall computer armoire with the shuttered doors that was about $1700. The doors had gotten broken in shipping (i didn’t want them anyway) but they had repaired the hinge holes. So, without doors, it was about $300-350. Its a beast, takes 4 to move it, but an additional coat of black and we were in business. I have the little yellow armoire as well with the full width desk and chaclk and bulletin boards. The top was cracked. Enter hubby, a slightly larger piece of MDF, a router, matching paint, and its perfect, but for only about $200. The huge round kitchen table with leaf? $300 instead of $1000 in the catalog. Needless to say i went there often – we used to live 5 minutes frim there, sigh. And they put an IKEA down the street too. Sigh. But their prices on artwork and lighting were great. And they had a lot of linens and rugs and such. The frontgate patio furniture looks even better in real life and at half price. One of my favorites is a $15 downward suction ironing board from frontgate. It was a lot more originally but just had a loose switch. Hubby would say his favorite find was an HDready Sony Projector for $300, list was almost $3K – at first he thought it was a cheapy unit, went home, looked it up, called the store and paid for it over the phone. I even have three of the fancy barstools in the attic. We need to add a bar but they used to have a barstool sale every uear and they were $25/ea. They have some other outlets, i know there is one in Atlanta but I can’t remember the others. If you can find one near you, its a fantastic source. You may still get to use your DIY skills a bit but their furniture is really solid. Everything elseni’ve looked at in there was nice as well.mmthat’s not always the case with catalogs, but their items like dishes and such have a nice heft to them, and feel as nice as they look. The one ballard item i have doubts about are the burlap drapes and such. I just don’t see hiw they get the smell out. Sometimes they have strange markdowns. I have one of their large framed corkboards that i think was $25. Why, i don’t know, there isn’t anything wrong with it. If it’s within day trip distance or on the way to relatives, i’d make a little time. I’ agree though, i’d probably sew the panels myself but there’s no way i’m making an armoire myself from scratch. I just thought i’d throw that out there. Even near the big one a lot of people didn’t know about it. Even my hubby loved shopping there, lots of high end gadgets, great prices . I haven’t seen it lately, but they used to do a big clearance catalog every year. I miss that but they do have the catalogs as ipad apps now which is kind of handy. Thanks for the post on the panels, its a great look. I too am a fan of stich witchery. 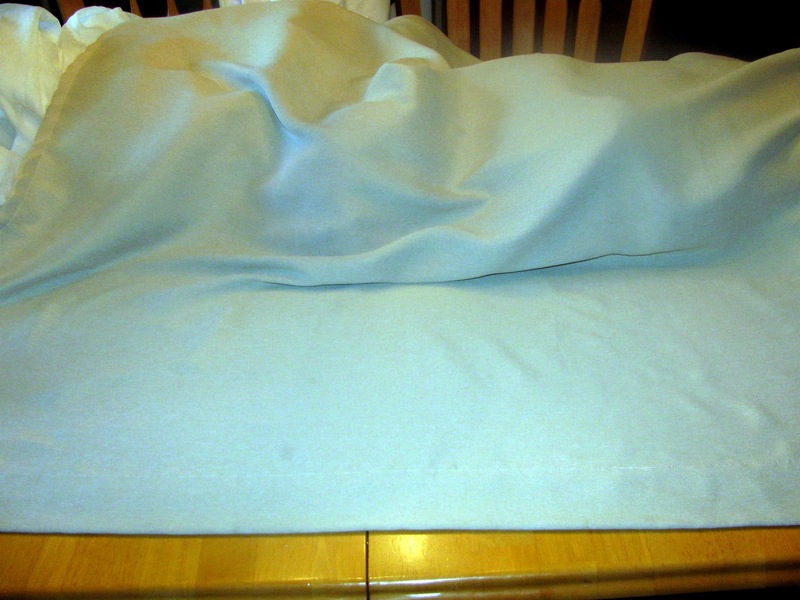 You can borrow a quilters trick if you want to get into sewing but keep the convenience of the iron on. They use it between fabrics but just tack it in place with a hot glue gun, without glue of course. It holds things where you want them without pins. THANK YOU! I was so inspired by you post! I used your idea to make my own curtain and shower curtain in a full bath in our house. I love the new look and especially love the cost savings from making it myself. You are welcome Christine. It always feels great to finish your own project. Great job! Where did you find those plain panels from!?! Luv them!